The Vancouver Canucks' record-setting road trip is under way. On Thursday the Canucks left the comfy confines of General Motors Place in Vancouver to embark on the longest road trip in NHL history, a 14-game, 13-city, 42-day voyage that will see them travel 12,885 miles. It begins with an 18-day, eight-game stretch leading into the Olympic break, and ends with six more games in nine days, finishing March 10. Forget unchartered territory, the mere concept of this trip is so alien that it's headache-inducing. The reason for the "Canucks over North America" tour is simple -- GM Place is the official hockey venue for next month's Winter Olympics, and that entails much more than slapping a sign on the side of the building. The painstaking conversion includes expanding the penalty boxes and player benches to accommodate additional people, building dressing rooms with capacity for 14 23-man teams, drastically altering the look and feel inside the arena and fully equipping the building to broadcast the most sought after sport at the Games to the world -- and don't forget that what goes up, must come down. All this work, which will be completed by a crew of hundreds working around the clock leading up the first game, a women's preliminary round matchup between Canada and Slovakia on Feb. 13, leaves the Canucks without a home for 42 days. During that time the players and staff will have absolutely no access to the building. "I try not to think about it like that, but now that you said it, it is overwhelming," admitted center Ryan Kesler, who had three assists in Vancouver's final home game Wednesday night, a 3-2 win over St. Louis. "You look at the road trip and see that we're going to be gone for 18 days to start so it's going to be one of those things where we've got to get our rest in and we've got to be smart about we eat." Added forward Rick Rypien, "I don't think people realize, with this road trip there's a lot of traveling, a lot of being on planes, a lot of jumping from one place to another right after you play and getting ready for the next game." Vancouver opens its tour in Toronto this Saturday on Hockey Day in Canada before jetting to Montreal, Ottawa, Boston, Tampa Bay, Florida, Columbus and Minnesota prior to the light at the end of the first tunnel coming into focus. For 18 of 26 Canucks, once Feb. 15 rolls around, they get a well-deserved, much-needed break while the NHL goes on hiatus for the Olympics. But Kesler, Roberto Luongo, Daniel and Henrik Sedin, Sami Salo, Christian Ehrhoff and Pavol Demitra won't get any time off -- they'll be representing their country at the Olympics and will squeeze at least another three games into their already-packed schedule. Although envious of the Olympians now, forward Alex Burrows knows that having a break midway through the trip will help a lot. 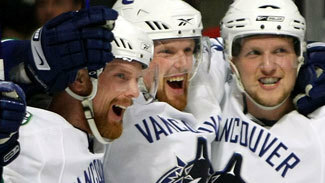 "It really helps that we've got it cut in two," Burrows said. "I think those first eight games are going to be hard, then we've got a little time to rest, then we go back at it, if you look at it that way, and that's the way I'm looking at it, it shouldn't be too bad. "We've got to take it one game at a time and as long as we're winning, we should have a good time." The post-Olympic portion of the trip is less forgiving, with Vancouver visiting six cities (Columbus, Detroit, Chicago, Nashville, Colorado and Phoenix) in nine days, a stretch that includes two sets of back-to-back games. In all, 5,672 miles -- about 44 percent of the total distance traveled -- will come during the second leg of the trip. Similar to when you were saddled in the backseat of the old family station wagon as a kid, the trip was a blast if you were having fun. As Burrows pointed out, it'll be the same for the Canucks, a team that has made a habit of stealing wins in opposing barns lately. Winning on the road seemed nearly impossible for the Canucks early on this season as they dropped their first four games and were 3-8-0 before getting into a groove. Vancouver now owns a 10-11-1 road record, having won six and collected points in seven of their last 10 games away from home. "I've always said we're a good road team, we've been showing it in our last 10 games [and when the trip begins] we're going to take care of things the same way we've been trying to take care of business here, which is one game at a time," said coach Alain Vigneault, who also touched on perhaps the most discussed issue of the trip: what and how to pack for such a gargantuan trek. For the first four games the Canucks will be faced with wintery conditions during a swing through Toronto, Montreal, Ottawa and Boston that means fuzzy tuques, thick jackets and layered socks. Then a quick two-game trip down South will have the team in need of light shorts, breathable T-shirts and loose sandals -- but then things cool off again in Columbus and Minnesota. There's only room for so many suitcases on the team plane, so the players had to get strategic with their packing. "You look at the road trip and see that we’re going to be gone for 18 days to start so it’s going to be one of those things where we’ve got to get our rest in and we’ve got to be smart about we eat." "I don't know about this one, this is a tough one, we're going through all sorts of climates, so snow coats, sandals, flip-flops, shorts, bathing suits, all kinds of stuff," laughed Luongo when asked what his carry-on will include. "I'll probably go with two or three suits and just keep it simple and obviously lots of socks and lots of underwear, plus some off day clothes," added Rypien. If you travel like forward Darcy Hordichuk, you've got to put the saying "less is more" to good use. "The guys are laughing; every time I pack for a four-day trip they bug me about bringing a massage table because I bring a big bag. I don't know what I'm going to do for this trip to get all the clothes in there," smirked Hordichuk, admitting that sometimes he doesn't make use of everything he packs. "My wife always laughs that I pack about 20 pairs of underwear and I come back home and 19 of them are untouched." All the packing, traveling, time zones, climate changes, etc., are a lot to get your head around, but above all else there are 28 points up for grabs -- and although right now it's the elephant in the room, how they handle their road trek could define their season. "I won't say it's make or break because there's still 15 or so games afterwards and mostly at home, so that's going to help," Burrows said, "but it could be a big swing either way. "We're not looking at it that way, I know it's boring but we're looking at it one game at a time."